Horton Foote wrote screenplay for Harper Lee novel "To Kill a Mockingbird"
Renowned playwright won Pulitzer for "The Man From Atlanta"
(CNN) -- (CNN) -- Horton Foote, the Pulitzer Prize- and Academy Award-winning screenwriter of "To Kill a Mockingbird," has died, according to officials at the Hartford Stage theater in Connecticut, where he was working on a production. 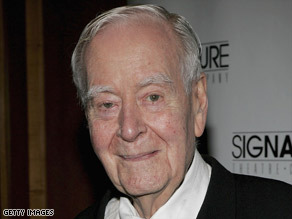 Horton Foote won Oscars for his "To Kill a Mockingbird" and "Tender Mercies" screenplays. Foote was born in Wharton, Texas, and, at age 16 moved to California to study acting. He would later move to New York, where he would transition to writing for the stage, television and movies, according to the Internet Movie Database. He won the Oscar for Best Adapted Screenplay in 1962 for his reworking of Harper Lee's classic novel "To Kill A Mockingbird," and another for Best Original Screenplay in 1983 for "Tender Mercies," which starred Robert Duvall as a down-and-out country singer. He also was nominated for 1985's "The Trip to Bountiful." In 1995, his play "The Man From Atlanta" was awarded the Pulitzer Prize for drama. "He was the warmest, most generous and most compassionate artist in the American theater," said Michael Wilson, artistic director at Hartford Stage in Hartford, Connecticut. The theater said on its Web site that Foote died in his sleep Wednesday at his temporary home in Hartford. "He created so many unforgettable characters, in so many indelible stories for the stage and screen that lifted our hearts and souls, and gave such vivid expression as to what it means to be human," Wilson said. Wilson first met Foote in 1987 and the two men became friends and frequent collaborators. They had been working on "The Orphan's Home Cycle," a nine-play theater event co-produced by Hartford Stage and New York's Signature Theatre to be staged in the fall. "He will be so sorely missed, but he leaves behind a vast legacy of plays that will inspire and enthrall future generations of theater audiences and artists," Wilson said in a statement on the theater's Web site. Despite his accolades, which included the Writers' Guild of America's lifetime achievement award in 1999, Foote was known as a quiet, unassuming artist more concerned with his work -- much of it set in the fictional town of Harrison, Texas -- than critical or financial success. "The last few years, critics have, on the whole, been very kind to me, but in writing I can't think about commercial things," he said in a 1999 interview with Playbill magazine. "It'd be the wrong end of the stick, so to speak. When I write a play, it's an entity. I've lived long enough to know things go in and out of fashion, and things not well received now can be totally reversed years later."